The indispensable account of the Ottoman Empire's Siege of Malta from the author of Hannibal and Gibraltar. In the first half of the sixteenth century, the Ottoman Empire was thought to be invincible. Suleiman the Magnificent, the Ottoman sultan, had expanded his empire from western Asia to southeastern Europe and North Africa. To secure control of the Mediterranean between these territories and launch an offensive into western Europe, Suleiman needed the small but strategically crucial island of Malta. But Suleiman's attempt to take the island from the Holy Roman Empire's Knights of St. John would emerge as one of the most famous and brutal military defeats in history. Forty-two years earlier, Suleiman had been victorious against the Knights of St. John when he drove them out of their island fortress at Rhodes. Believing he would repeat this victory, the sultan sent an armada to Malta. When they captured Fort St. Elmo, the Ottoman forces ruthlessly took no prisoners. The Roman grand master La Vallette responded by having his Ottoman captives beheaded. Then the battle for Malta began in earnest: no quarter asked, none given. 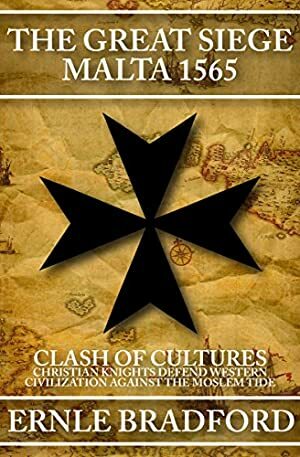 Ernle Bradford's compelling and thoroughly researched account of the Great Siege of Malta recalls not just an epic battle, but a clash of civilizations unlike anything since the time of Alexander the Great. It is "a superior, readable treatment of an important but little-discussed epic from the Renaissance past... An astonishing tale" (Kirkus Reviews). Log In to track Ernle Bradford on eReaderIQ. to be notified each time the price drops on any book by Ernle Bradford. to stop tracking Ernle Bradford. We started tracking this book on April 26, 2014. The price of this book has changed 89 times in the past 1,821 days. The current price of this book is $1.99 last checked 20 hours ago. The lowest price to date was $0.99 last reached on May 9, 2017. The highest price to date was $10.99 last reached on May 8, 2018. This book has been $10.99 2 times since we started tracking it. We last verified the price of this book about 20 hours ago. At that time, the price was $1.99. This price is subject to change. The price displayed on the Amazon.com website at the time of purchase is the price you will pay for this book. Please confirm the price before making any purchases.